In a state that is noted for its dedicated car culture, it seems a given that residents and tourists would benefit from any measurable decrease in road congestion, car exhaust, and air pollution. As National Bike Month winds down and South Florida, communities make moves to become more bike friendly, it pays to talk about the potential environmental impact of having more bicycles and less cars on Florida's roads. 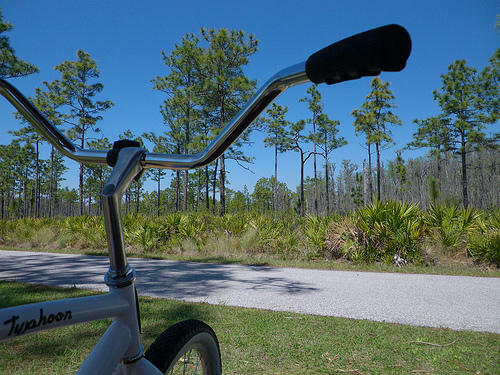 Bicycling and the environment have a close relationship in South Florida. "Even a modest increase in bike trips would have real benefits," says Tim Blumenthal, president of the Bikes Belong Coalition, a nationwide bike industry group that advocates for safe bicycling communities through initiatives like PeopleForBikes. "There are about 4.5 billion bike rides in the country in an average year," Blumenthal says. Roughly half of those are "transportation trips that could've been driven," as opposed to recreational outings. That number could easily increase, given that many trips taken by Americans are within an easy bicycling distance. A 2009 survey conducted by the U.S. Department of Transportation shows that 53 percent of all trips in urban areas are three miles or less. If more Floridians were to choose bicycling over driving for even those short trips, the impact -- including on carbon dioxide emissions -- would be cumulative. Data from the U.S. Environmental Protection Agency shows that the average carbon dioxide emissions for one mile driven are 374 grams. Note that this applies to cars manufactured in 2012; older cars generate greater emissions. Given that carbon dioxide levels in the atmosphere have twice in the past month passed the "long feared milestone" of 400 parts per million, any reduction -- no matter how slight -- should be welcomed. Another factor to consider is the gasoline wasted as commuters idle in road-construction-related traffic throughout South Florida. Collin Worth, bike coordinator for the city of Miami, expects to see additional converts to the growing Miami bicycle culture as construction woes in the metro area send commuters searching for alternatives to stop-and-go (or simply stopped) traffic. In bike-friendly countries like Denmark, government agencies have quantified the environmental and economical impact of bicycling versus driving, concluding that a mile on a bike is equivalent to a 42-cent societal gain, whereas a mile driven costs 20 cents. (Read more about the study here.) While there are no readily available studies that formulate a similar cost analysis specific for South Florida, Blumenthal is confident that existing data supports the notion that every mile biked adds up. In related bicycle news, Gov. Rick Scott this week vetoed a $50 million project that would've linked Florida's east and west coasts through a single, shared pedestrian and bicycle trail. Proponents of the project said it would make Florida more appealing to tourists, particularly those with a proclivity for outdoor activities. One particular evening will always stick with me. I was commuting home from work and at the intersection of U.S. 1 and Southwest 27th Avenue, which is a pretty intense during evening rush hour. As I crossed the intersection, I was cut off by a driver who was clearly unaware of my presence, despite the bike lane. The car came within inches of my bike. Being familiar with this intersection, I know when and where I need to be watching. Had I not known where to look, I would not have been able to break in time. This is a place that’s sunny, warm, and flat. It seems like it should be a pretty perfect place to ride a bike. It’s not. Last month, the 36-year-old father, husband and amateur triathelte Aaron Cohen was hit and killed by a car while riding on the Rickenbacker Causeway. The tragedy revived a debate about how drivers and cyclists share—or don’t share—our roads. Riding a bike is a childhood right of passage. As we age, we move from tricycle to bike with training wheels to classic two-wheeler. But at some point we shift from bikes to the expanded mobility of owning a car. Kathryn Moore, program manager at Broward B-Cycle, thinks people should consider going back to the basics when it comes to getting around downtown Fort Lauderdale.